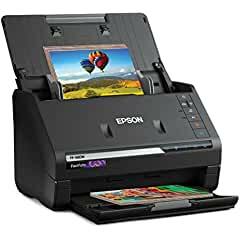 Epson has expanded its high-speed scanning line with the new Wi-Fi enabled FastFoto® FF-680W High-Speed Photo and Document Scanning System. The FF-680W scanner is the world's fastest personal photo scanner, scanning thousands of photos – as fast as one photo per second at 300 dpi at up to 36 photos per batch. Building on the success of the FastFoto FF-640 scanner, the FF-680W scanner offers worry-free scanning for a variety of media types and sizes, including postcards, panoramic photos up to 36 inches and Polaroid photos as well as convenient photo restoration, editing and smart file organization tools. Families can scan, restore and organize collections of photos for quick and easy sharing, archiving and enlargements with the new FF-680W scanner. And, with the Easy Auto-Upload feature, the FastFoto scanner software makes it simple to share images to cloud services such as Dropbox® and Google Drive.